For many years now, community and business leaders have been calling on federal, provincial and municipal governments to work together to tackle transportation issues in the Greater Toronto and Hamilton Area (GTHA). There is a widespread consensus that incremental change is not sufficient and that our transportation system needs to be dramatically transformed to meet the needs of the 21st century. In Canadaâ€™s economic heartland, the transportation system needs to be effective, integrated and multi-modal, and it needs to be funded in a sustainable way. This is fundamental to the health of our economy, the environment and our quality of life. The concern about transportation issues has never been higher and public appetite for coordinated action on transportation has never been more pronounced. In response to this widespread concern, in 2006 the Government of Ontario established the Greater Toronto Transportation Authority (GTTA) under the Greater Toronto Transportation Authority Act. The GTTA, which became known as Metrolinx in December 2007, was given the mandate to develop and implement an integrated multi-modal transportation plan for the GTHA. Metrolinx is also responsible for the development of an Investment Strategy and capital plan, coordination of a transit vehicle purchasing co-operative, and programs such as BikeLinx and the Smart Commute Initiative. The GTTA Act also includes provisions for Metrolinx to assume responsibility for GO Transit in the future. This document â€” the Regional Transportation Plan (RTP), which includes the Investment Strategy â€” provides a vision, goals and objectives for the future in which transportation within the GTHA is seamless, coordinated, efficient, equitable and user-centred. It also contains Strategies, Priority Actions and Supporting Policies that are needed to achieve the future vision, as well as an Investment Strategy to finance the transportation system over the short- and long-terms. The RTP builds on the extensive work that has been carried out by Metrolinx and others to date. This includes the development of, and consultation on, seven Green Papers in late 2007 and early 2008. These Green Papers presented, for public discussion, information on transportation trends, challenges and opportunities for the GTHA transportation system and best practices from around the world. Green Paper 7: Transit (March 2008). 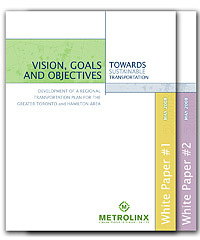 In May 2008, building on the input received on the Green Papers, Metrolinx released two White Papers for public comment. White Paper 1: Vision, Goals and Objectives presented a proposed vision for the GTHA transportation system as well as a series of goals and objectives that could form the basis for developing, evaluating and ultimately shaping the RTP. White Paper 2: Preliminary Directions and Concepts explored a range of potential policies, programs and tools for the RTP. It also presented a series of transportation system concepts, and modelled them to see how they would perform against a range of indicators such as transit ridership, congestion rates, and emissions of greenhouse gases (GHGs) and air pollutants. 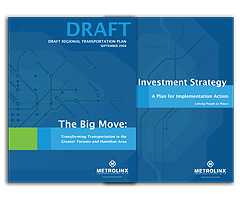 In September 2008, Metrolinx released a Draft of the Regional Transportation Plan as well as a Draft Investment Strategy. These brought together the options and concepts from the White Papers into a recommended action plan for the GTHA, and were the basis for a series of stakeholder consultations and public meetings across the GTHA. The Green and White Papers and the Draft RTP and Investment Strategy, and the feedback that has been received on them from stakeholders and the public, have informed the development of this final Regional Transportation Plan.